Pavlov was born on September 26, 1849, in Ryazan, in central Russia. His father, a priest and scholar, taught the boy to read and encouraged him to read all books at least twice. Pavlov’s family expected him to enter the clergy, but while studying at divinity school, he developed an interest in physiology and CHARLES DARWIN’s recently published theory of evolution. Pavlov entered St. Petersburg University to study science and graduated in 1875. He earned a medical degree in 1879 and a doctoral degree in 1883 from the Military Medical Academy, St. Petersburg. In 1890 Pavlov became director of physiology at a new Institute for Experimental Medicine in St. Petersburg. He performed experiments showing that the secretion of digestive juices does not require the presence of food in the stomach. He allowed dogs to see, smell, and swallow food, but then removed the food from their throats through surgery, and digestive juices were secreted just as if the food had reached the dogs’ stomachs. He also studied the connections between nerves and gastric glands and the stimulation of the salivary glands. For his work on digestion, he received the 1904 Nobel Prize for Physiology or Medicine. Pavlov published his classic work Conditioned Reflexes in 1907, and in 1910 he performed a set of experiments that led to the term “Pavlov’s dog.” He rang a bell each time certain dogs were given food and demonstrated that those dogs would later salivate at the sound of the bell, even without the presence of food. They had been trained (or “conditioned”) to respond to a specific stimulus. After the 1917 Bolshevik Revolution in Russia, Pavlov was an outspoken opponent of the new Communist regime, but his fame as an accomplished scientist protected him from the government suppression that silenced many of his colleagues. He died on February 27, 1936, in Leningrad, Russia. Pavlov advanced the understanding of animal physiology and influenced the development of theoretical and practical psychology. Pavlov’s work launched a field of psychological research exploring the influence of conditioned reflexes on learning, behavior, and neurosis. 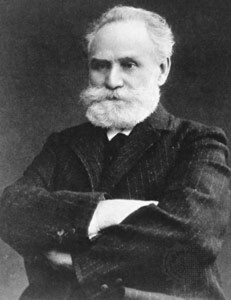 Pavlov’s followers believed that conditioned reflexes were responsible for much human behavior and neurological disorder. They treated some mental patients by isolating them in quiet surroundings where no physiological or psychological stimuli could trigger conditioned responses. Such investigations led to a greater understanding of some psychopathological disorders, such as hysteria, obsessive neurosis, and paranoia. A debate quickly arose between followers of Pavlov and SIGMUND FREUD. Freud taught that the individual’s thought processes (particularly the unconscious) drive human behavior. While Freudian psychology has somewhat overshadowed Pavlovian ideas and shaped treatment of psychological distress in Western societies, Pavlov’s ideas have still had a profound effect in many areas of psychological treatment. Pavlov’s influence led directly to the development of a school of psychological study and treatment called behavioral psychology, which was championed by American psychologist B. E Skinner in the 1940s. Behavioral psychology analyzes human behavior as a set of responses to the individual’s environment and behavior therapy focuses on reconditioning patterns of behavior by adjusting the rewards for certain types of actions. Variations of such behavior­ modification techniques using these principles have developed; these include everything from the benign assertiveness­ training workshops developed in the 1970s in which outwardly expressive behavior is rewarded with positive feedback from a group, to the more controversial aversion­ therapy techniques in which a painful chemical or electrical stimulus is delivered to a subject following undesirable behavior. Pavlov pioneered the humane treatment of laboratory animals. He was among the first to maintaining healthy living conditions for them and to understand the problems associated with pharmaceutical use and with allowing disease to spread among a laboratory population. He instituted aseptic surgical procedures and believed in minimizing pain.